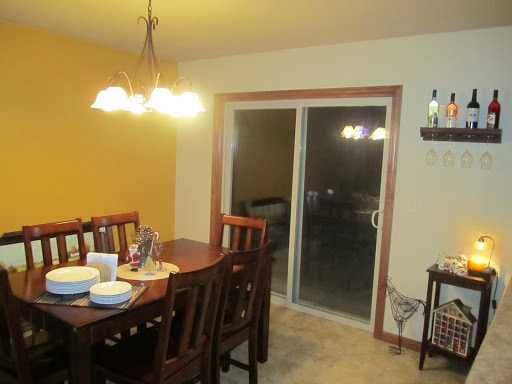 We had people over for the Packer/Vikings playoff game, so our house was really clean and presentable so I decided to take that opportunity to take pictures of our house. But I just want you to know that our house is usually presentable. You can do a pop-in to check! 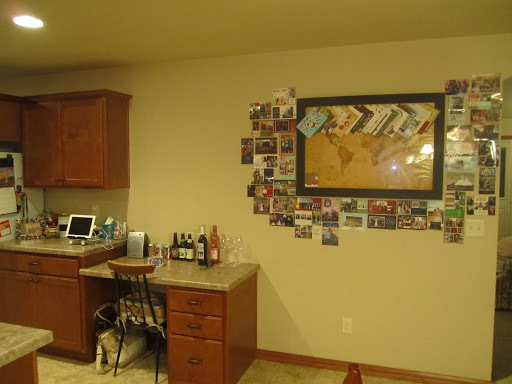 I considered not putting up pictures of the inside of our house to encourage people to come and visit, but then I was like, meh, whatever. No visitors means less cleaning. 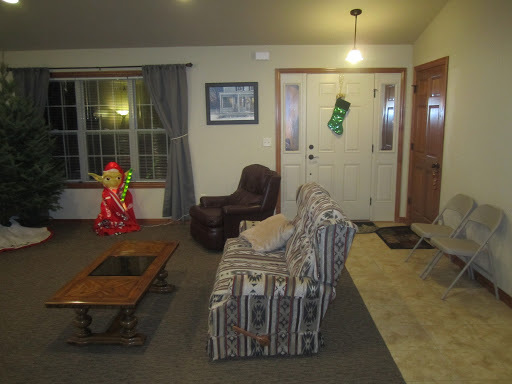 A lot of times when we have people come over, we have them come in through the garage so that they don’t have to walk outside in the freezing temperatures. Welcome! 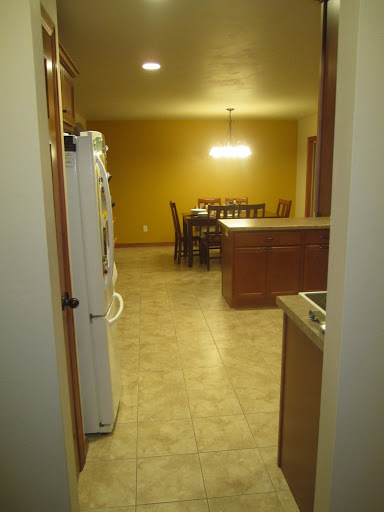 To the right, we have the laundry room. 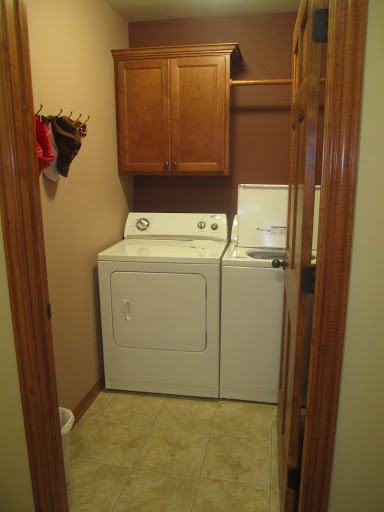 Also tidied up for the guests, there are usually clothes drying on the bar above the dryer. As you can see, there’s not a place for me to let the laundry pile up. Which is definitely a good thing. Walking further into the kitchen, we come to our patio doors, which I love during the daytime but hate hate HATE at night. We reallyyyyyyy need to get some blinds for these doors because when I’m watching tv, when I look to my left I look into a deep, dark abyss that’s really scary. When Peter’s not home, it’s pure torture. On the other side of the kitchen table is a painting that we’re going to eventually put on the yellow wall. I’m waiting to put it up until I find something decorative to hang on either side. I LOVE our kitchen. Favorite room of the house. Usually the appliances aren’t all shoved onto the far counter, but we served the food on the front counter, so I moved everything over. We LOVED all the Christmas love we got this year! Seriously, what is the point of mail after December? Also, on the counter where our beverages are, there is usually junk piled up. And I get annoyed with myself EVERY TIME it happens, yet it continues to happen. We also have our electronic charging station, with too many electronics always connected. We live in a sick (but AWESOME) world. We just got a new entertainment center, so we just moved the old one aside until we figure out what to do with it. It wont’ always look like this… Also, Peter is DYING to mount the tv on the wall, which I think is going to happen in the next couple of months while I’m traveling. 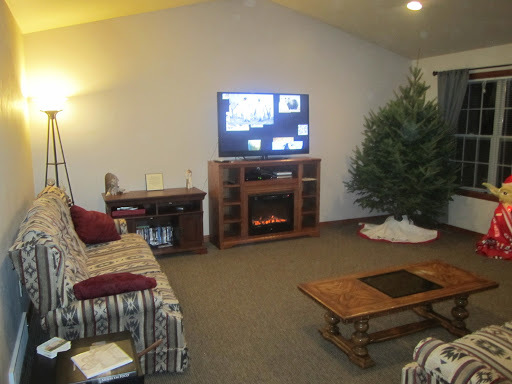 Sometime in the next couple of days, the Christmas tree will be completely removed. When the tree and old entertainment center are gone, I’ll start brainstorming what to put on either side of the new entertainment center. I’m in no rush to find something, though. 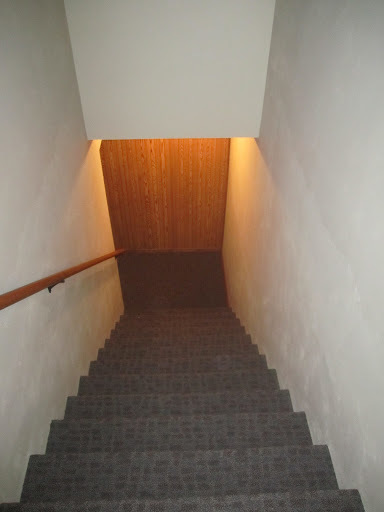 If you turn around, you see down the hallway. 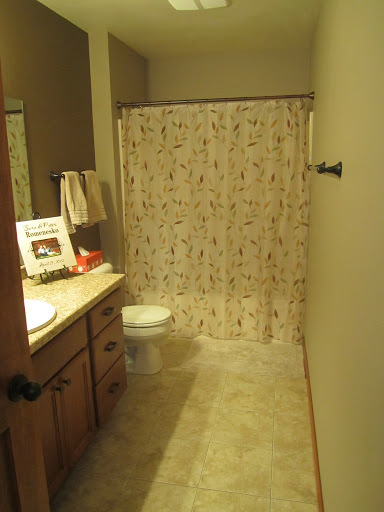 To the right is our spare bathroom. 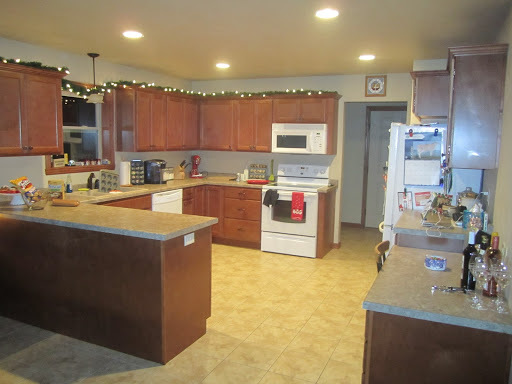 The counter top isn’t usually this busy, but Peter hooked up his wireless speakers in the kitchen and bathroom so that no one would miss anything during the game while they weren’t in the living room. 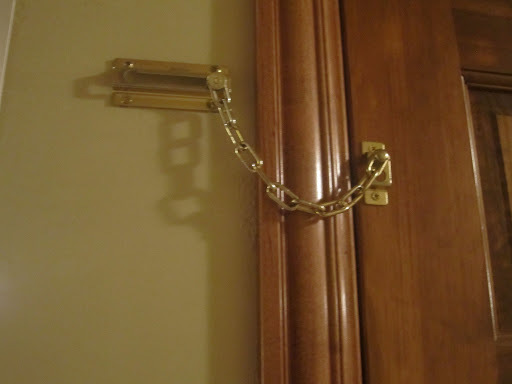 The first door down the hallway is the basement, which has this nice little lock on it so that when Peter’s being bad he can be locked in the basement. Just kidding (or am I?). 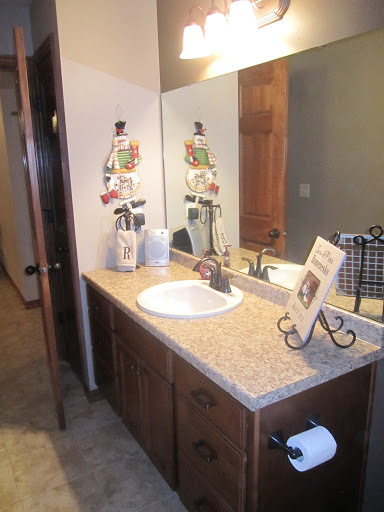 It was really installed because the previous owners had a cat named Tubby, whose litter box was in the basement. So they could crack the door and not have any kids falling down the stairs. I really hate our basement. 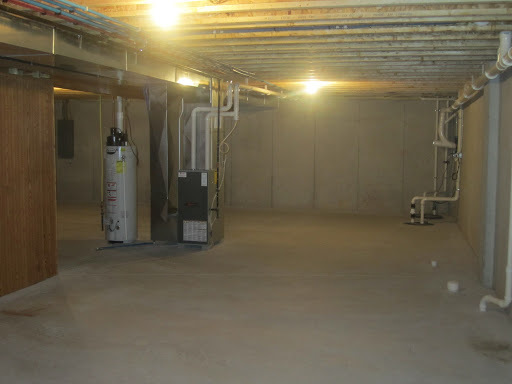 I hate basements that aren’t completely finished in general. I’m pretty sure that my fear comes from growing up with a 100+ year old basement that had rock walls and a lot of spiders. When we saw the house for the first time, there were deer heads and stuff on the walls down here. So that was scary. 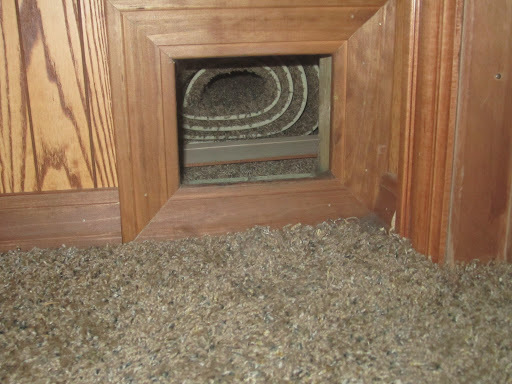 Scarier though, is the little hole that’s in the wall for Tubby to get to his litter box that is on the completely unfinished side of the basement. I HATE this cat hole. Because in my mind, it’s a RAT hole, and I’m so scared that something it going to come running out at me. 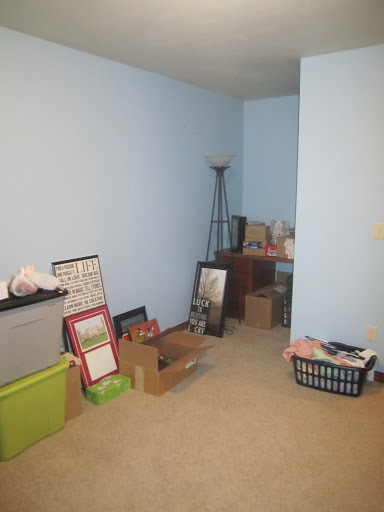 Beyond the wood-paneled room is tons and tons of storage. Tons. More storage! 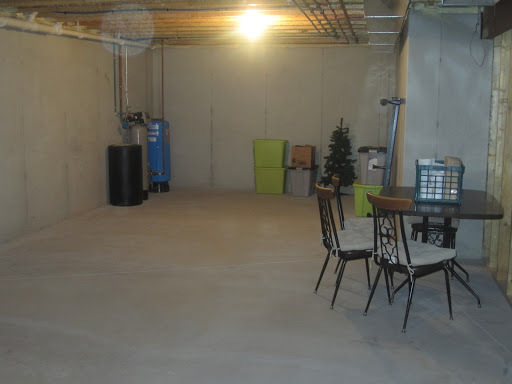 Peter has big plans of completely finishing the basement someday, which I am fully supportive of. As long as I don’t have to do it. Back upstairs and down the hallway, we come to the next door on the left. The Packer room. 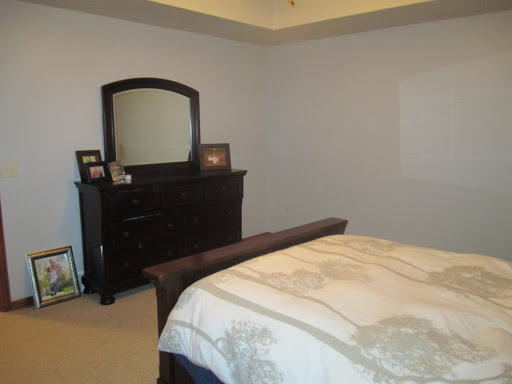 Now is probably a good time to tell you that we Peter only re-painted the master bedroom. 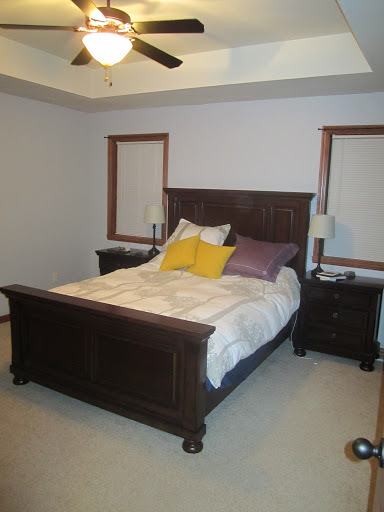 I have agreed to leave the spare rooms painted as we found them until we have kids. Then, the Packer colors are DEFINITELY going. 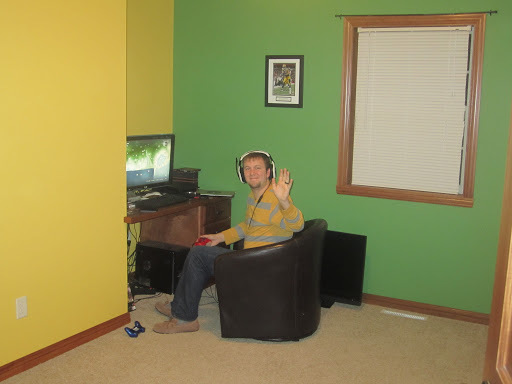 This would be considered Peter’s “man-cave”. 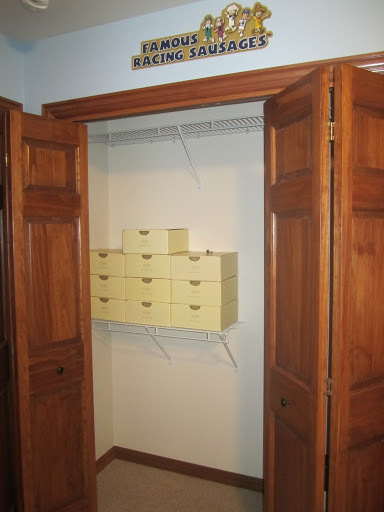 This closet is where we put junk that we don’t know what to do with. I really should go through and just throw stuff away… Like the Soda Stream. 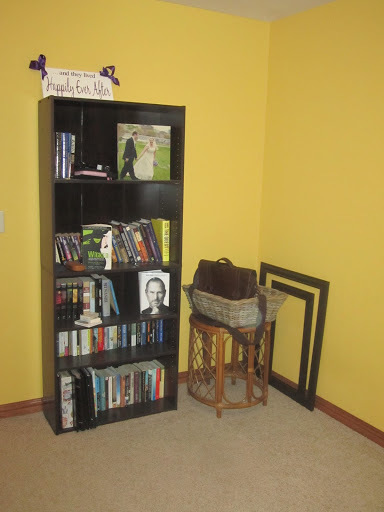 Ideally, I would like to have a bookcase in the living room, but we’re not going to finish the living room until we get new furniture. So it’s in the green and yellow room. The next room down the hall is what used to be the Brewer room. 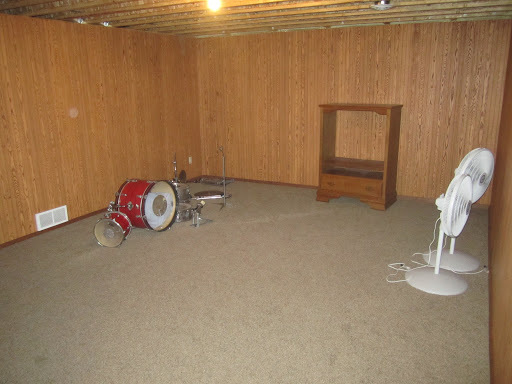 This room is currently used for: instrument storage, storage for decorations that I want to put up sooner than later, and Christmas presents that I moved from the living room to the spare room before our company came. 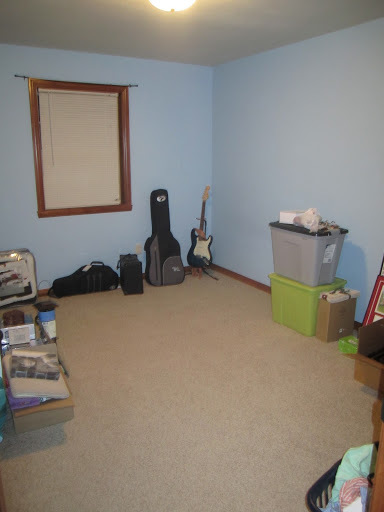 This spring we’re getting a bed for this room, so things will get more organized. And also the decorations that got misplaced when I decorated for Christmas. Oh, and the dreaded clothes-to-be-ironed basket. The previous owners forgot one of the Famous Racing Sausages decals above our china closet. The sausage decals were all around the room when we viewed the house. Do you think they like Wisconsin sports? 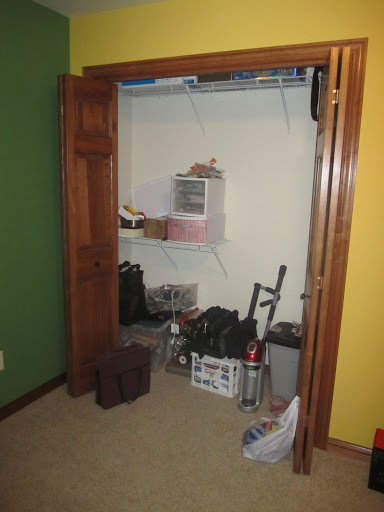 At the end of the hallway is a really big storage closet. 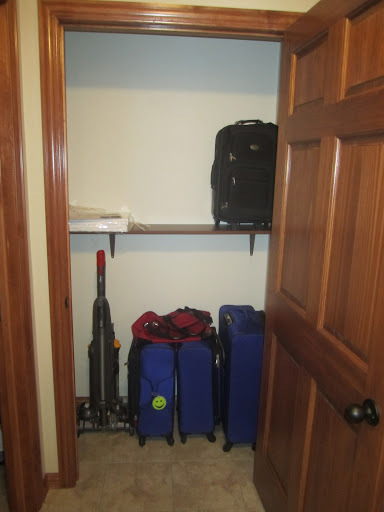 When we viewed the house, there were really nice shelves, but when we moved in the were gone. So when I was out of the country Peter put holes in the wall up a shelf for me. I’m hoping for a few more in the future. 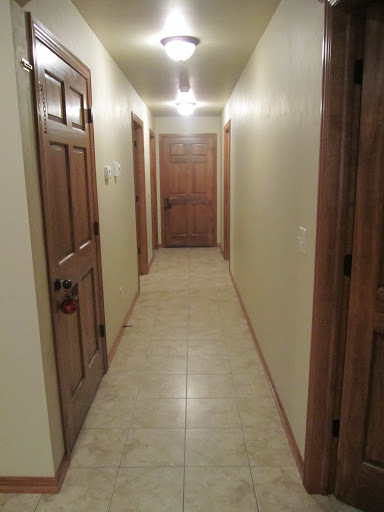 The last room down the hallway is our bedroom. I love the furniture and the tray ceiling. 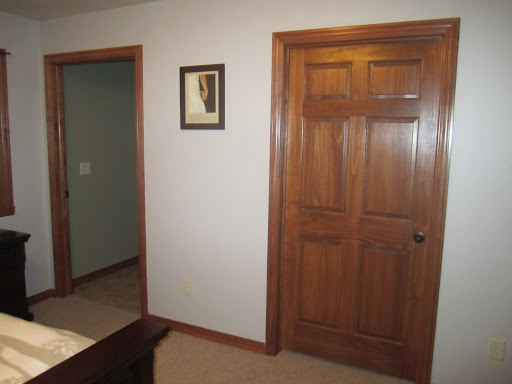 This was the only room that was re-painted. Peter was awesome and surprised me by painting it the color I had chosen while I was traveling. Just a note: this is the furniture that started the whole house hunt. We ended up getting the same furniture that Peter promised me we could get when we bought a house. He really is the best. He also makes the bed every morning. Eventually we’ll put pictures or something on the walls, but I’m not sure what yet. 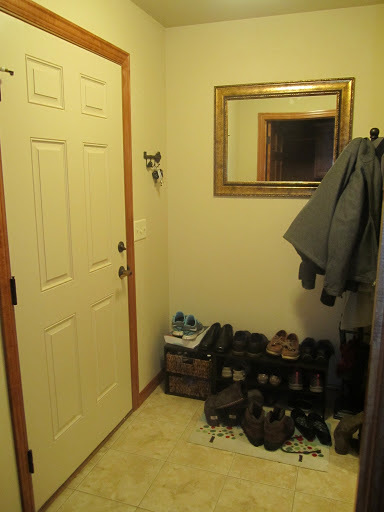 Behind the closed door is a walk-in closet that I chose not to show because it’s where all of the laundry that can’t fit in the laundry room is stored. Just trust me when I tell you that it’s nice. 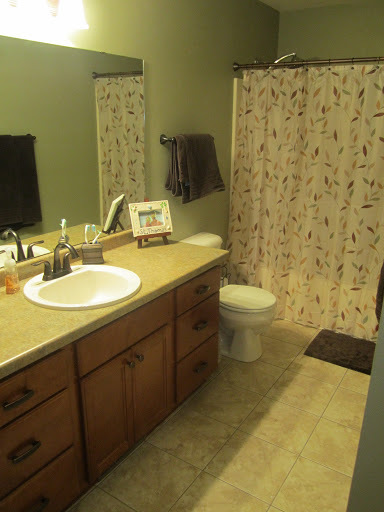 And finally, the master bathroom. 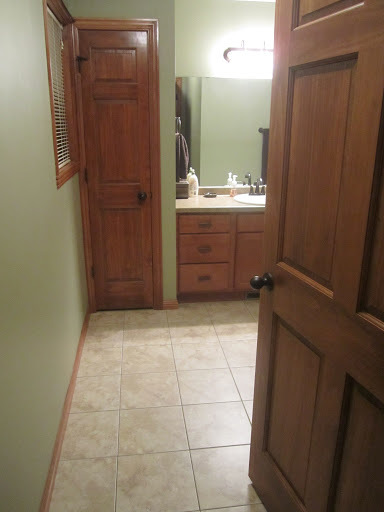 The bedroom was originally the same color as the bathroom. I’m boring and bought the same shower curtain for both bathrooms. I just really liked the curtain! So! That’s it! The house that we’re tied to for the next 30 years. We really found a gem when we started the house hunt that I was so hesitant about.